I love falling down rabbit wholes and I thought I would share some with you. This is a list of blogs, sites about food history and recipe sites. I hope you will find some of them useful as well. Please let me know if you have a history food blog or know of a site that I should check out. passthegarum.co.uk: The blog is about a modern cook cooking Mediterranean (mostly Roman) food from antiquity. The blog has both posts about food history and recipes. ancientworldalive.com: The blog is genrally about antiquity, but there is a good section both on food and on recipes. vikingfoodguy.com: About viking age food and food culture. The blog has recipes and other infomation based on practical experience by a reenactor. The person who runs it is finish but everything is in English. 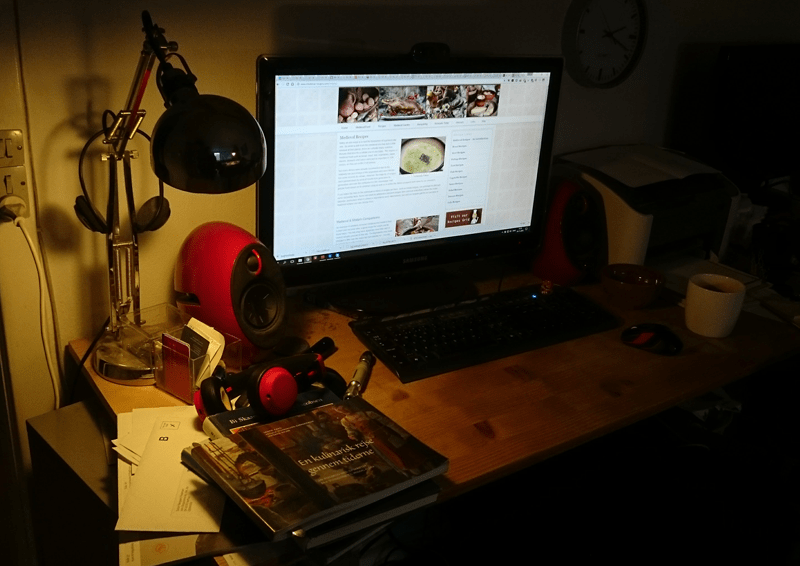 Eldrimner: a blog about medieval and viking age food. An overview of what the archelogical sources tells us that the vikings ate, Sca based. viking answer lady.com: As a big section of dayly life among that a section on food. The life and recipes of a medieval cook: Recipes and food blogging about medieval cooking, with the sources in the blog post. Let hem boyle: 1300-1600’s cooking blog. Another Finish blogger with the site in English. The site has recipes as well as food blogging. Goode Eates: Recipes and food blogging about medieval cooking, with the sources in the blog post. It also has reviews of food history books and cookbooks. There are also more general food blogging. Jacob and Julian: A couple cooking medieval food – quite often serving it to a grumpy dad. It has lots of step by step pictures and is quite entertaining. cook-a-long: A site for Medieval and Renaissance Cooking enthusiasts. It has not been updated in years but the infomation is still good. medievalcuisine.com: It is not pretty but is has good modernised recipes and a lot of interesting infomation on medieval cursine. cookit.e2bn.org: Lots of recipes from different historical periods from pre-historic up until the 1980s. They have videos with instructions as well as a written recipe. Henry Notaker’s Old Cookbooks and Food History: Transcriptions of early cookbooks and manuscripts. Horrible layout but the infomation is there. ribevikingecenter.dk: Viking recipes based on experimental archaeology explained for fire cooking. the viking world: A wiki with recipes for viking food. godecookery.com: This is an amazing resource if what you are looking for is medieval recipes. They always have both the original recipe as well as a modern adaption. medieval-recipes.com: The site has a few medieval recipes but what makes it interesting is all the other information about the medieval period. Among other things there is a section on the medieval garden. The Rijksmuseum’s website you can explore a huge part of their collection in detail. The art is there for you to zoom around on and to save on your computer – in a rather large resolution. Web Gally of Art: The Web Gallery of Art is a searchable database of European fine arts and architecture (8th-19th centuries), currently containing over 41.100 reproductions.